Hani, Hani (2005) Peran Dukungan Sosial Dalam Menanggulangi Peranan Depresi Pada Perempuan Pengidap HIV. Skripsi thesis, Universitas Tarumanagara. 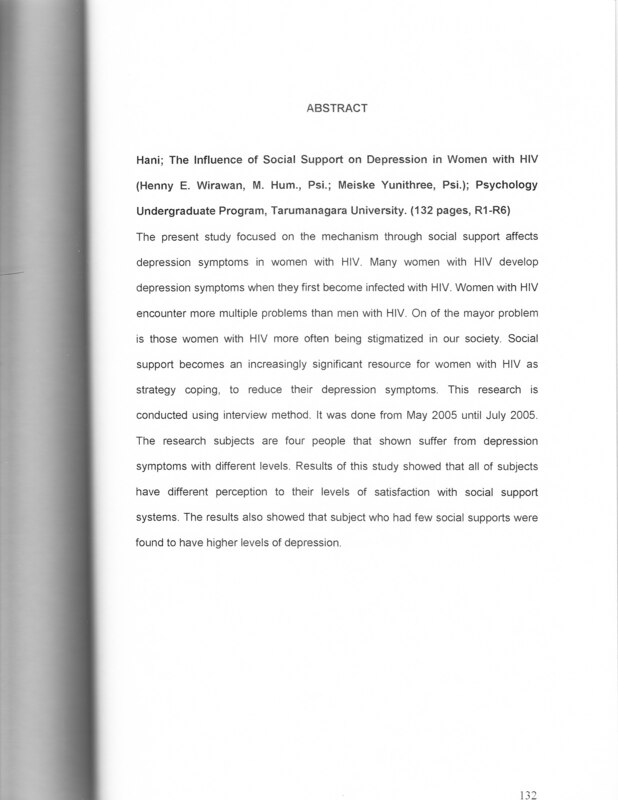 The present study focused on the mechanism through social support affects depression symptoms in women with HIV. Many women with HIV develop depression symptoms when they first become infected with HIV. Women with HIV encounter more multiple problems than men with HIV. On of the mayor problem is those women with HIV more often being stigmatized in our society. Social support becomes an increasingly significant resource for women with HIV as strategy coping, to reduce their depression symptoms. This research is conducted using interview method. It was done from May 2005 until July 2005 . The research subjects are four people that shown suffer from depression symptoms with different levels. Results of this study showed that all of subjects have different perception to their levels of satisfaction with social support systems. The results also showed that subject who had few social supports were found to have higher levels of depression.